Give pollinators a late-summer treat with a bright container. It’s got to that point in the summer where you’ve got most of your plants in, and you’ve tried to keep everything going despite less rain – but maybe you’ve done a quick survey and noticed a little more colour could be squeezed into the garden? Not only that, have you provided enough for butterflies and bees? Well, if you’re lacking in suitable pollinator plants, it’s a good excuse to get planting now! 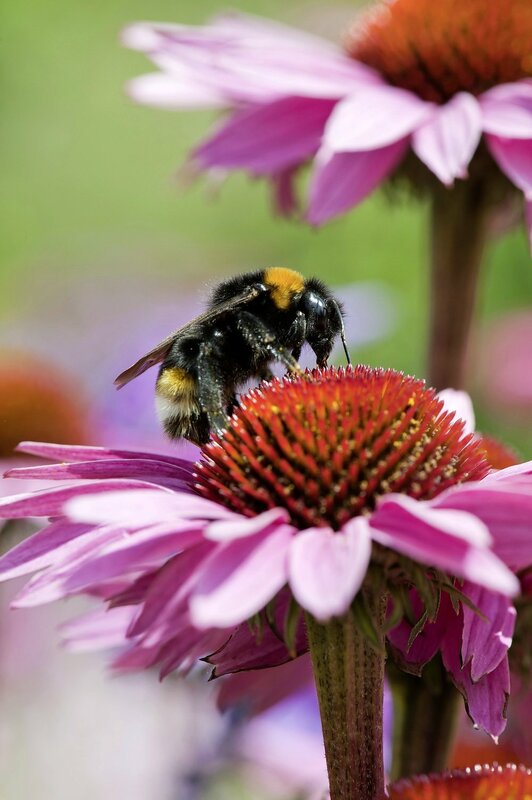 Bees are always under pressure to find enough pollen and nectar, and streamlined, landscaped gardens, farm fields or grass verges stripped of useful flowers, or gardens planted with only foliage or sterile blowsy bedding can play a part. The recent hot weather means bees get tired and expend more energy, so help them out so they don’t have to fly far to get more sustenance. Don’t think your plot’s too small for some helpful bee plants – you can always pop some in a pot! Take a trip to the garden centre and watch what the bees land on; simply pick the blooms they love. Use a good multi-purpose compost, and keep the pot watered well – once the plants die down in autumn, any perennials that have gone over can be planted out in the garden. Kill two birds with one stone – bring bright patio flower power to your plot, and help our friendly bees!